Note: Pololu has released a newer version of the RC Servo Multiplexer 4-Channel, which is bette.. Note: Pololu has released a newer version of the RC Switch with Digital Output, which is better.. Note: Pololu has released a newer version of the RC Switch with Medium Low-Side MOSFET, which i.. 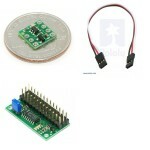 Note: Pololu has released a newer version of the RC Switch with Small Low-Side MOSFET, which is.. Note: This servo cable has been replaced by a new version that has male and female ends that are com.. This servo extension cable has female JR connectors on both ends, so it can be used to make connecti..
Discontinuation Notice: This product has been discontinued. Please consider the Pololu servo ex.. This 12" (300 mm) Y-cable is typically used to connect two servos to a single servo port on an RC re..